General depiction of the crust. 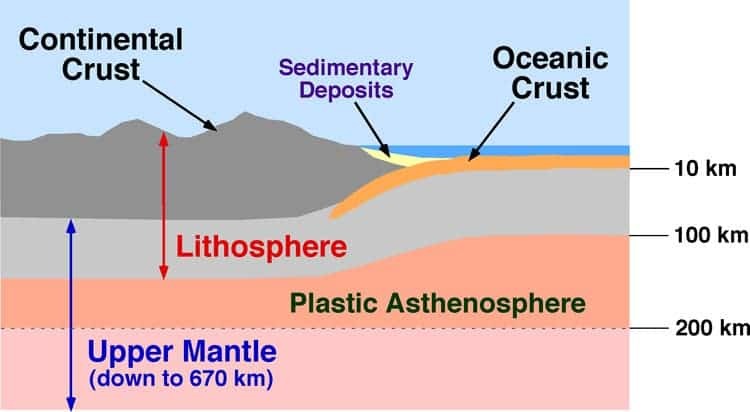 Most geologists did not believe that water could penetrate into the lower ductile crust, but a new study has shown that this does indeed happen. Researchers conducted isotopic analysis on minerals brought up by tectonic uplift showed that rainwater can reach (and perhaps even surpass) the brittle ductile transition zone, at 6-8 km. 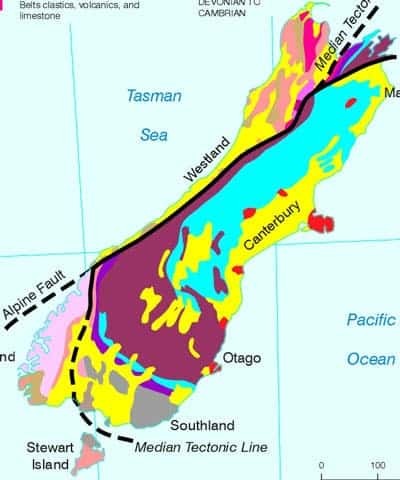 Dr. Catriona Menzies and Professor Stephen Roberts, with their team of scientists from the University of South Hampton, the University of Otago and the Scottish Universities Environmental Research Centre, conducted the analysis in New Zealand’s Southern Alps – where tectonic movement constantly pushes deeper parts of the tectonic plate upwards. These minerals carry with them a history of the fluids which passed through them, and that history can be scanned for isotopes and reconstructed. Basically, whenever a fluid passes through a rock they leave behind a tiny deposit – and that is the key here. Geological map of New Zealand. By identifying hydrogen and oxygen isotopes the authors mapped the water content at different depths. In the 0-2 km traces of rainwater can be easily found, but they were quite surprised to find the same thing as they went deeper and deeper – even further than 6 km. Again, they didn’t core to those depths, they just studied minerals which were at that depth and brought up by tectonic activity. It’s also important to note that this is meteoric water – water from meteorological cycles which precipitates as rain or snow; it is not magmatic (or juvenile) water, the water present in magma since its genesis, which can only be brought up by eruptions or magma uplift. Rainwater can play an important role in fault activation or reactivation – weakening the rocks and acting like a lubricant, so understanding how it infiltrates and what depths it reaches can improve our understanding of seismic risk and earthquake triggering. It also has interesting implications for our understanding of valuable minerals, such as gold and quartz. Furthermore, it can also play a role in orogenesis, depending on its flowpath.